Welcome to the QUESTAR Awards! For over 25 years, this international festival has given honor to your best work in commercials, DVD’s, PSA’s, TV content, in-house videos, VNR’s and web-links. Awards given in 70+ individual classifications. 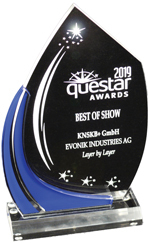 Best of Category winners are presented with prestigious brass-plated plaques, and the BEST OF SHOW winner takes the impressive QUESTAR trophy. The program is established to celebrate and reward the best in visual communications. The QUESTAR Award symbolizes the stellar qualities of creativity, craft, innovation and originality. Winners become members of the QUESTAR Awards elite — the most successful and influential creators of visual communications in the world. Countries competing in the QUESTAR Awards include: Argentina, Australia, Austria, Canada, Denmark, Germany, Hong Kong, People’s Republic of China, Singapore, Switzerland, Russia, Turkey, the United Kingdom, and the United States. Judges represented creative directors, directors of broadcast services, producers, directors, marketing coordinators, production managers, public relations managers, and presidents of production houses, agencies, and corporations. The QUESTAR Award symbolizes the creative energy that is transformed by the craft, innovation, and skill into the excellence of the video medium. It is the creativity, originality, and talent of the individuals involved to whom the awards festival is dedicated.